Bartolomé de Las Casas, O.P. (1484 – July 17, 1566) was a sixteenth century Spanish priest and the first resident Bishop of Chiapas. As a settler in the New World, he was galvanized by witnessing the brutal torture and genocide of the Native Americans by the Spanish colonists. Las Casas was an enlightened advocate of the humanity and fair-treatment of the Amerindians, against much criticism and opposition. In the history of cultural destruction that the European colonization of the Americas represents, his was a humane and compassionate voice to which too few of his time paid heed. Bartolomé de Las Casas became famous for his advocacy of the rights of Native Americans, whose cultures (especially in the Caribbean) he described with care in his writings. His descriptions of Caciques (chiefs or princes), Bohiques (shamans or clerics), Ni-Taínos (noblemen), and Naborias (common folk), clearly show a feudal structure. His book A Short Account of the Destruction of the Indies (Brevísima relación de la destrucción de las Indias) published in 1552, gives a vivid description of the atrocities committed by the conquistadors in the Americas—most particularly, the Caribbean, Central America, and what is now modern Mexico—including many events to which he was a witness, as well as some events he documented from others' eye witness accounts. In one of his last works before his death, De thesauris in Peru, he vigorously defended the rights of the natives of Peru against the native slavery imposed by the early Spanish Conquest. The work also questions the right of property Spain had in taking the treasures derived from the ransom to free Atahualpa (the Inca leader), as well as those valuables found and taken from the burial sites of the indigenous population. Dedicated to King Philip II of Spain, Las Casas explained that he supported the acts of barbarism when he first arrived in the New World, but that he soon became convinced that the horrendous acts would eventually lead to the collapse of Spain itself in an act of Divine retribution. According to Las Casas, it was the responsibility of the Spanish to convert the Indians, who would then be loyal subjects of Spain, rather than to kill them. To avoid the burden of slavery on them, Las Casas proposed that Africans be brought to America instead, though he later changed his mind about this when he saw the effects of slavery on Africans. Largely due to his efforts, the New Laws were adopted in 1542 to protect the Indians in colonies. 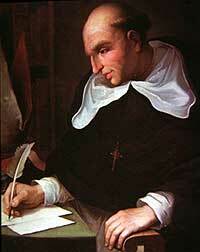 Las Casas also wrote the monumental Historia de las Indias as the editor of Christopher Columbus's published journal. He was instrumental, during the course of his repeated return trips to Spain, in gaining the temporary repeal of the encomienda regulations that established virtual slave labor gangs in Spanish America. Las Casas returned to Spain and was eventually able to bring about the great debate of 1550 in Valladolid between himself and the advocate for the colonists, Juan Ginés de Sepúlveda (1490–1573). Though the encomienda system triumphed, championed by the colonial Spanish classes who were profiting from it, the writings of Las Casas were translated and republished across Europe. His published accounts are central documents in the "Black Legend" of Spanish colonial atrocities. They influenced the essayist Montaigne's views of the New World. Sepúlveda cited Aristotle's theory that certain people are naturally slaves, and argued that there was very little difference between Amerindians and animals. They worshiped, he said, the devil as God and “natural law” obligated them to accept Spanish rule. In his view, the Spanish were superior, the natives inferior, just as children were to adults or (in his view) women were to men. Las Casas disagreed and criticized the actions of the conquerors as motivated merely by the desire for gold, which resulted in unspeakable acts of cruelty (Lunenfeld, 1991). Bartolomé de Las Casas was born in Seville, probably in 1484, although 1474 is the traditional date. With his father, he immigrated to the Caribbean island of Hispaniola in 1502. He became a priest eight years later, and served as a missionary to the Arawak (Taino) of Cuba in 1512. His 1520-1521 attempt to create a more equitable colonial society in Venezuela was brought down by his colonial neighbors, who were able to incite a native rebellion against him. In 1522, he joined the Dominican Order (Order of Preachers). Some accounts claim that Las Casas was descended from a converso family, that is, Jews who were forced to convert to Christianity. He died in Madrid in 1566.
de Las Casas, Bartolomé Apologetic History of the Indies. Retrieved August 23, 2007. Orique, David, O.P. Confesionario: Avisos y Reglas Para Confesores. Retrieved August 23, 2007. History of "Bartolomé de Las Casas"
This page was last modified on 3 April 2008, at 19:42.